This Thomas the Train cake required 5 boxes of cake mixes to make. Three of the boxes were used to make 3 separate 12 inch cakes. The other 2 boxes were used to make four separate 6 inch cakes. Each cake is cooled and then frosted. I then covered each cake with homemade colored fondant. For the trains, I molded Rice Krispie treats, frosted them and covered them with fondant. I then used the fondant to make the faces for each of the trains. I used frosting to "glue" the pieces together. I placed the twins in the cakes and then used fondant to decorate the rest of the cake including the train tracks as you shown in the picture above. I also placed the birthday child's name on the cake and put the birthday message on the cake board as shown. 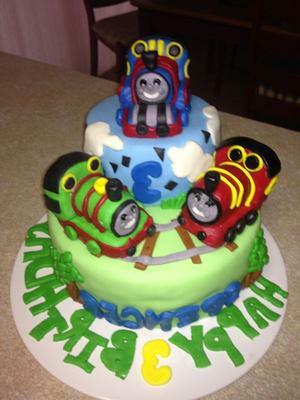 I have made this Thomas the train cake twice. Both times it has been a huge hit! This is such an adorable cake. I love it. Very good job. Great job!! It is adorable! Any little boy (or girl) would love to have this at a party. Simply amazing. Really captures the joy and wonder of Sodor Island - land of Thomas the Train and Friends.